Japan supports Asian cities to develop low carbon planning and implementation under several schemes. Asia-Pacific Integrated Model (AIM) team supports to develop low carbon action plan in Asian cities such as Vietnam, Indonesia, Cambodia and supports know-how transfer of Tokyo Metropolitan Government’s building climate action to cities in Malaysia and Vietnam. IGES supports Semarang in Indonesia to apply know-how of renewable energy and public transportation in Toyama city. In this side event, we will share local climate actions on the ground and discuss about how to enhance “Global Climate Action”. 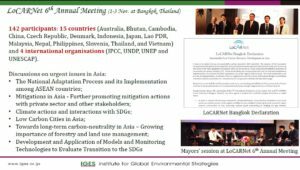 At the end of the event, LoCARNet Bangkok Declaration will be announced by Ms. Tomoko Ishikawa, the Secretary General of LoCARNet. This declaration was drafted in the LoCARNet 6th Annual Meeting which was held in Bangkok in 1-3 November 2017, which is encouraging actions not only from the central government but also by the non-state actors such as cities, local governments, businesses, financial organisations and civil societies. The declaratoin was agreed by participants of LoCARNet 6th Annual Meeting and of the 3rd ICLCA which was held in parallel with the LoCARNet Annual Meeting.